Imagine a giant pink flamingo in your kitchen, sitting on your shelf. Well, actually, he’s nearly12” high, but he holds an awful lot of cookies or crackers or other munchies. 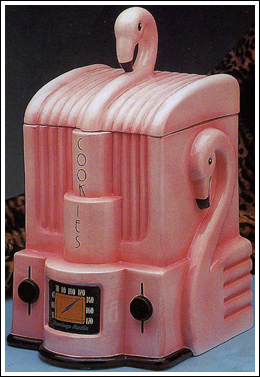 Cast ceramic, frivolous and fun, pink flamingo radio cookie jar in rendered in a sleek Miami Deco style. We bet you know someone who would love to take him home. 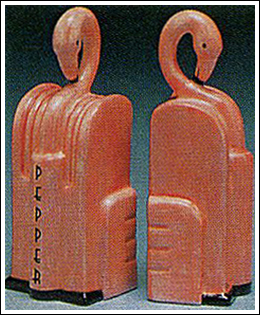 The matching mini flamingo salt and pepper set stands 4” high and will look lovely on your table.